Cardoen Geel opened in July 2018. This new store is in a top location at the Geel-West driveway complex. We are proud of our first location in the Kempen! In November Cardoen opens a new car supermarket in Charleroi. We are very proud to have a car supermarket near this metropolis. This the 4th showroom of Cardoen in Wallonia. Cardoen opens a pop-up store in the heart of Antwerp, near the Meir in the Stadsfeestzaal. Until the end of February, you can visit the smallest car-supermarket in the Stadsfeestzaal for advice, information, orientation and to make a reservation for your new car. In a short span of time Cardoen doesn’t open 1 but 2 new car showrooms in Wallonia. 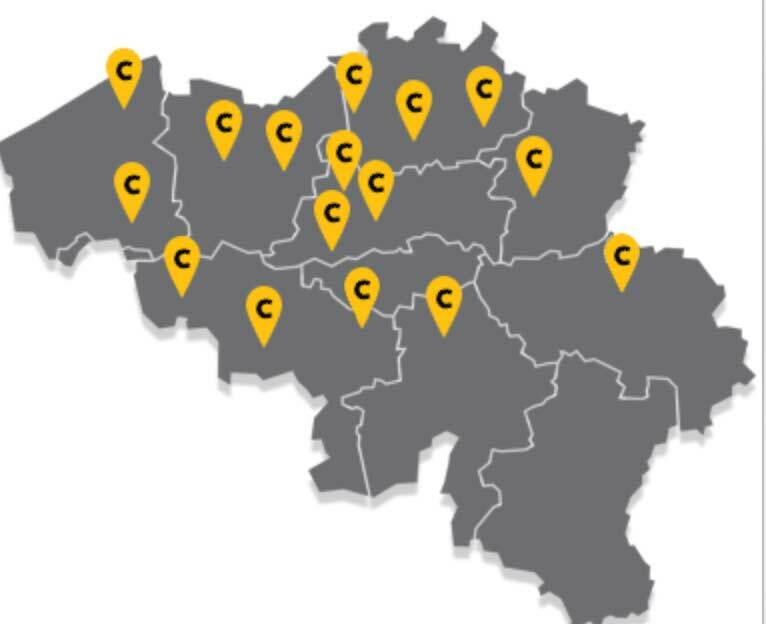 At the end of 2018 in Cardoen starts in the city of Liège. This brings the total of car supermarkets in Wallonia at 5 instead of 3 earlier that year. Impressive ! Cardoen Mons is born in January 2017. We're proud of our third car supermarket in the south of Belgium. Cardoen Kortrijk is born in March 2016. We're proud of our second car supermarket in West Flanders. Cardoen Hanciaux Namur becomes Cardoen Namur. This car supermarket is no longer managed by a subsidiary, but is now 100% run by Cardoen. Cardoen opens three new car supermarkets in seven months. Cardoen Brussels, Cardoen Bruges and Cardoen Lier open their doors between February and August 2014. 2013 was a record year. Car Supermarket Cardoen has been a spectacular growth of 45% compared to the previous year. Cardoen benefits from the overstocks from manufacturers to sell cars at discount prices, and sells an average of 37 cars per day. Cardoen wins 3th "SPECIAL AWARD 2012" of the Federauto Awards! "The jury praises Cardoen for the particular contribution it makes to the promotion of the image of the car sector"
In Tournai Cardoen launches a new concept: the outer car supermarket! By pressing the costs, Cardoen is able to offer its customers even more advantageous cars ... Definitely worth a visit! Cardoen Gent expands and therefore moves to a new building (6,000m² showroom!) near Ghent / Expo. Currently reached via Kortrijksesteenweg (running just past Dockx)or via the Loop from the E40 (site Flanders Expo). The Nissan Tiida is presented to the Belgian public in premiere by Cardoen. This anti-crisis car costs around € 20,000 catalog abroad. Cardoen price? from € 12,999! In less than a month for 80 Tiida's door went out! Cardoen gets the press from China to the United States with the stunt action "2nd car free '. The first two weeks of this action more than 400 cars were sold! Cardoen proposes for the first time in Europe, the Chinese car brands to the Belgian and Dutch public. Behind the scenes Cardoen is working hard to introduce these brands in Europe and plays a pioneering role. The Dacia Logan for the first time for sale in Western Europe. by Cardoen! In success of Cardoen, Renault follows this example. Opening of the first Cardoen car supermarket outside Belgium: Cardoen Roosendaal (Netherlands). First in Europe Cardoen start working with a large distributor of food: Colruyt. Still a successful partner of Cardoen. Opening Cardoen in Eke at Ghent. This is the first car supermarket outside Antwerp. There will be more to come. Cardoen moves from the center of Antwerp to the Boomsesteenweg Wilrijk. Opening of a giant showroom of 7500 m2 with permanent 900 cars in stock. Open 7/7. Cardoen has now risen to market leader in the multi-brand car distribution in the Belgium. Cardoen begins selling new cars (imported from Spain and Italy) in addition to the nearly new cars. Son Karel Cardoen takes precedence and focusses young used cars. Buying and selling cars abroad. In the heart of Antwerp Albert Cardoen start selling 2nd hand cars.